Home Video Review: "13 Assassins"
Usually you have to choose between quiet, moody, historical dramas and balls-out, limb-slicing action flicks. Well, not anymore. Takashi Miike's "13 Assassins" didn't get much of a theatrical go-round in this country (Subtitles! Run away! ), but you have no excuse for not giving it a spin on DVD or Blu-ray. It's a slow-burn of a movie, for sure, but once it starts burning…wow. 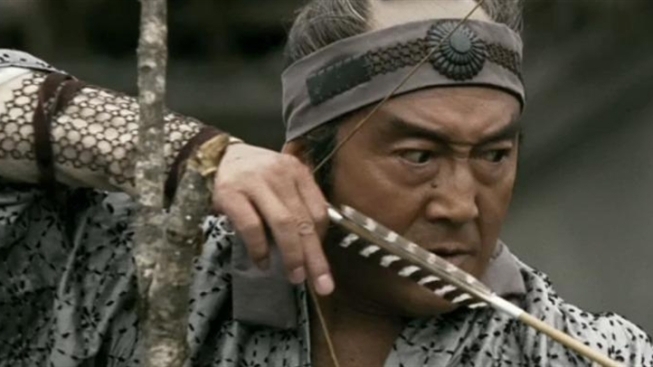 Imagine if "The Expendables" was competently acted, had some historical/political weight anchoring its plot, had something meaningful to say about life and death, and had coherent but no less badass action and you have a sense of what to expect from "13 Assassins." In a nutshell, the movie is about an aging samurai in a time when his art is dying out who gathers a dozen fellow swordsmen together for what amounts to a suicide mission to take out a bloodthirsty nobleman. If you know any of Miike's previous work ("Audition," "Ichi the Killer") you might approach "13 Assassins" expecting a nonstop nightmare of blood and debauchery. Not that you won't get some of that, of course, but Miike actually crafts a quietly haunting historical drama only punctuated with moments of bloody violence and nightmarish imagery (Samurai hero Shinzaemon's face to face meeting with one of the evil Lord Naritsugu's still-living victims is more unsettling than almost any recent horror movie). He also throws in some welcome doses of humor. Among the many highlights are actors Goro Inagaki, who plays Naritsugu as a cold, numb serial killer, and Koji Yakusho, whose Shinzaemon not only accepts his suicide mission, he actually welcomes it. And, of course, when your climax involves an entire village transformed into a death trap, 13 samurai against an army of 200, and a herd of flaming bulls (Miike's only misstep, if only because the CGI is a bit shoddy. The idea, though? Awesomesauce), you know you're in for something amazing. In fact, "13 Assassins'" finale plays like some incredible hybrid of "The Last Samurai," "Kill Bill," and "300." We'd recommend the Blu-ray if you have the means, only because the first half of the movie is extremely dark and candle-lit, which could make for maddening viewing in a lower res. The deleted scenes included on both formats are rare in that, while you can see why they were cut, they actually offer some interesting new character developments and are worth watching, as well. Oh, and to anyone who does a "biggest movie badasses" list without including Tsuyoshi Ihara's Hirayama ("Kill anyone who gets past me") - you're doing it wrong.